The FTC approval process continues for the planned acquisition of Rite Aid Corporation by Walgreens Boots Alliance. The two companies set a self-imposed deadline of October 26, 2016 in terms agreed upon last fall. The chart below outlines the size of such a deal. 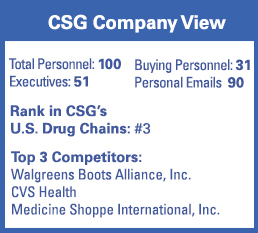 With 12,000+ US stores experiencing change and uncertainty, opportunities for CSG partners and clients will exist. 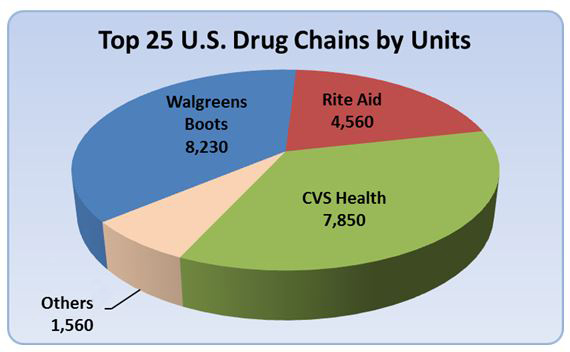 Historical Data Source: Chain Store Guide’s Drug & HBC Chains Database. Estimated growth is based on a proprietary trend analysis. Actual figures are subject to change. This data is not intended for investment decisions.